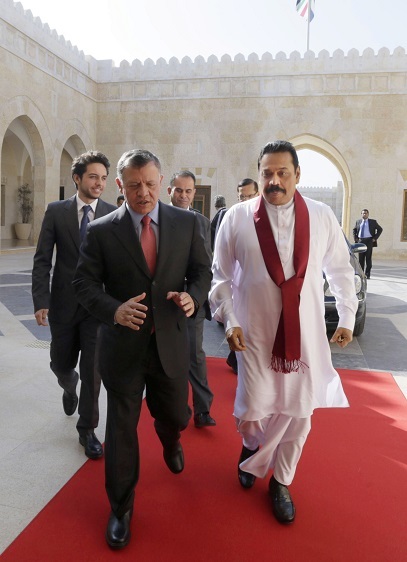 LankaWeb – Sri Lankan President holds bilateral discussions with the King of Jordan. 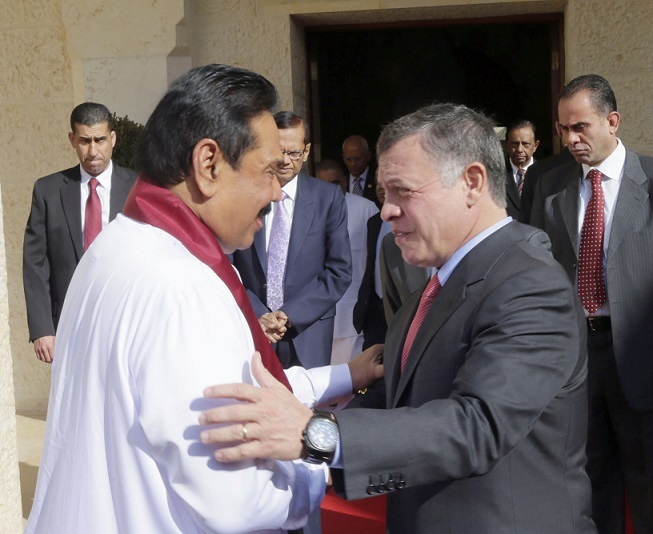 Sri Lankan President holds bilateral discussions with the King of Jordan. President Mahinda Rajapaksa who is on an official tour of Middle East, has begun bilateral discussions with the King of Jordan on Sunday afternoon (05 January) at the Royal Hashemite Court in Amman. President Rajapaksa was received with a warm welcome by the King of Jordan His Majesty King Abdulla II Ibn Al Hussein at the Royal Court where bilateral discussions took place between Sri Lanka and Jordan. Both leaders focused attention on a number of topics relevant to both countries, including cooperation in defense-related activities and progress of the Joint Committee. King Abdullah stressed the need to bolster the friendship and cooperation between the two nations in economic, commercial, investment and other common interest and regional and international issues. Sri Lanka is the largest supplier of tea to Jordan. 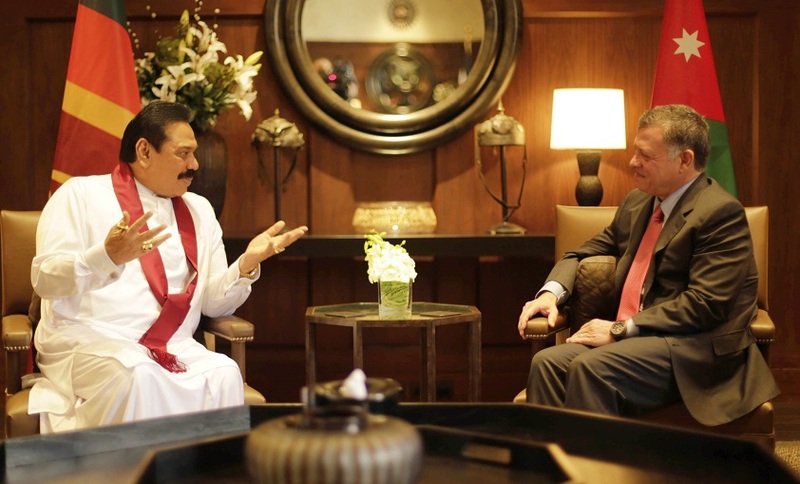 Therefore President Rajapaksa requested King Abdullah for duty concessions for Sri Lankan Tea imported to Jordan. He also praised the care Jordan provides for Sri Lankan workers in the Kingdom. This is the third time President Rajapaksa visited King Abdullah. The president met him last time when he attended the G11 summit in 2009. Diplomatic relations between Sri Lanka and Jordan established in 1965 and Sri Lankan embassy in Amman was established in 1996. His Royal Highness Crown Prince Al Hussein Ibn Abdullah, Jordanian Foreign Minister, Minister of External Affairs Prof. G.L. Peiris, Monitoring MP of the Ministry of External Affairs Sajin Vass Gunawardena, UNP Parliamentarian John Amaratunga, Secretary to the President Lalith Weeratunga and Sri Lanka’s Ambassador in Jordan Gamini Rajapaksa were also present at the bilateral discussions. After holding talks in Jordan, President Rajapaksa will leave for a two day official visit to Palestine. The President will hold discussions on bilateral relations with the Palestinian President Mahmoud Abbas, will lay a wreath at the Mausoleum of the former Palestinian President Yasser Arafat, meet members of the Sri Lanka Palestine Friendship Association and make a visit to the Church of Nativity. During his two day official visit to Israel, the President will hold discussions with the Israeli Prime Minister Benjamin Nethanyahu and the Israel President Shimon Peres. Leaving the country when the US war crimes joker came to SL is good. But getting too close to PALESTINE is not wise. Even Muslim countries don’t give a damn about Palestine. This entry was posted on Monday, January 6th, 2014. You can follow any responses to this entry through the RSS 2.0 feed. You can skip to the end and leave a response.